Here at Jezebel HQ, we have a lot of opinions and a lot of beliefs. Of those, chiefly, we think gummy candy is good, and believe that we need several packs of them to get through the day. This has resulted in only one root canal this year, as far as I’m aware. When we heard, via the New York Post, that Dylan’s Candy Bar is unveiling the nation’s first custom 3D gummy candy printer (available online beginning in June), emotions (obviously) ran high. According to the Post, customers can use a photo of anyone—your cat, Blake Lively, Kim Jong Un, your boss’s high school basketball portrait—to be modeled in a batch of custom gummies. Customers can also choose from a set of drawings, or sketch their own name, shape, or word. 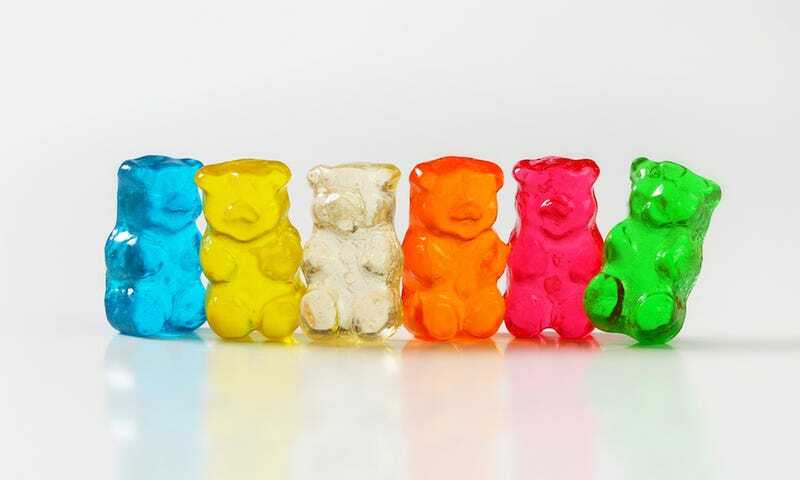 The gummies, made from natural fruit and vegetable extracts rather than gelatin, are gluten and dairy-free, and come in eight different flavors and colors. You can also add glitter, sour or fizzy dust. The only drawback: each gummy costs $20, and they are about the size of your hand. Personally, I have never wanted a gummy that big. Part of the appeal of gummy candy is that it is cute, miniature, and squishy, and you can eat them whole. That said, I still feel good about this, and I will report back.